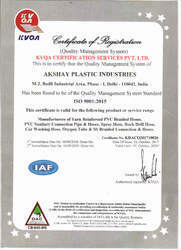 “Akshay Plastic Industries,” is a well-known entity, established in the year 1998, at Delhi (India). Our company is counted amongst the foremost Manufacturers, Trader, Wholesalers, and Exporters of PVC Products such as PVC Nylon Braided Hoses, PVC Flexible Sanitary Connection Pipe, PVC Flexible Food Grade Hose and PVC Flexible Pipes and Tubes. The offered range comprises PVC Nylon Braided Hose for LPG Gas & Welding, Five Layer Car Washing, Rock Drill, Chemical and Pesticide spray, Sanitary Connections, Pvc Food Grade Braided Hose, Flexible Tubes, etc. The offered products are developed using the virgin raw material, sophisticated technology and in compliance with the international standards. Also, Quality, Innovation, Responsibility, and Spontaneity are the constant managing concepts of our firm. These products are appreciated among our valuable clients for durability, sturdy construction, high tensile strength and longer service life and low maintenance. Our products are available in variegated sizes, thickness, lengths and other specifications as per the varied requirements of the clients. Due to our advanced and hi-tech infrastructural facility, we are able to deliver these products within the limited time frame at par with the set industry standards. Our vast infrastructure is segregated into various units such as production, quality testing, research & development, warehousing & packaging, sales & marketing, etc. The unit is manned and managed with skilled professionals who are well-trained and are responsible for supplying products having unmatched quality. We have rigorous quality checks at every stage of the manufacturing process. Also, we are a quality oriented entity that has the main motto to maintain consistent quality. We make sure that before final delivery, our products are carefully checked on different parameters, so that no error or discrepancy occurs at the client's end. We have a team of highly skilled professionals who have immense expertise in their respective fields of operation. Owing to their commitment and devotion, we are capable of achieving the pre-determined goals of our organization. Our professionals follow ethical business policies and maintain proper communication with the esteemed clients that help us attain their trust and faith. We have capacious warehousing facility that empowers us to store the entire assortment safely in a well organized manner. Moreover, our ethical business practices, transparent dealings and quality centric approach have made us one of the important names in the both national and international market. We have won great accolades all over the world by fulfilling the ever growing demands of customers in an efficient manner. Apart from this, due to prompt delivery, cost effective pricing structures and transparent dealings, we have been able to garner a huge base of satisfied clients across the globe. Our wide distribution network, on time delivery and easy payment modes also aid us to become the preferred choice of our customers and achieve the utmost position in the industry. PVC Products, Hoses, Sanitaryware Products, Specialized Assemblies, etc. “Akshay Plastic Industries,” is a well-known entity, established in the year 1998, at Delhi (India). Our company is counted amongst the foremost manufacturers, wholesalers, exporters and suppliers of PVC Products such as PVC Braided Hoses, PVC Flexible Sanitary Connection Pipe, PVC Flexible Food Grade Hose, Spray Hose, High-Pressure Hoses and other PVC Flexible Pipes and Tubes. 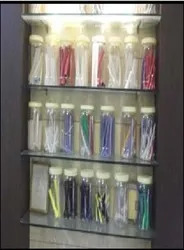 The offered range comprises PVC Nylon Braided Hose for LPG Gas & Welding, Five Layer Car Washing, Rock Drill, Chemical and Pesticide spray, Sanitary Connections, Pvc Food Grade Braided Hose, Flexible Tubes, etc. The offered products are developed using virgin raw material, sophisticated technology and in compliance with the international standards. Also, Quality, Innovation, Responsibility and Spontaneity are the constant managing concepts of our firm. We are a renowned manufacturer, wholesaler, exporter and supplier of a comprehensive assortment of PVC Products like PVC Nylon Braided Hoses, PVC Flexible Sanitary Connection Pipe, etc.